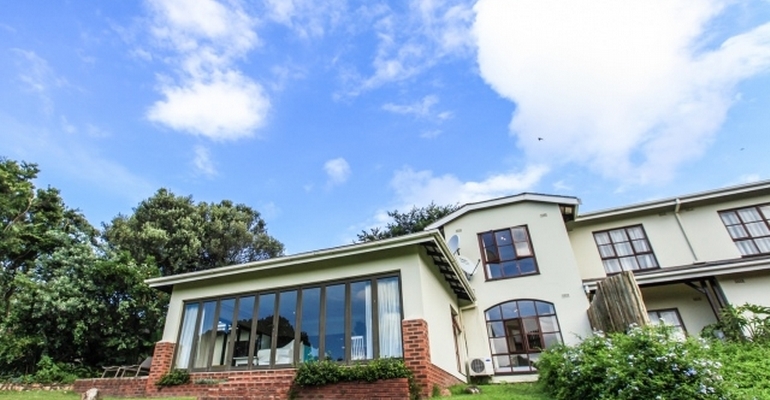 Fifteen on the Fifth is so named for the gorgeous views this guest house has of the fairway at Selborne Golf Estate. A fully tiled open-plan conservatory with lounge and dining suite has completely retractable glass stack-back doors allowing for a full view of the fairway and dam beyond. Leading off from the conservatory is an open veranda with outdoor table & chairs. A free standing braai and Weber for easy outdoor catering makes this area of the house magnificent for entertaining. The lounge has an eight seater cushioned suite with large coffee table that faces the mounted large flat screen TV. Full DSTV ensures that guests will never miss out on those sporting events or favourite shows. Open-plan to the lounge is the Dining area with 6 seater dining table. A modern kitchen, fully equipped for self-catering requirements makes holiday catering a pleasure. Kitchen facilities include cutlery, crockery, kettle, toaster, microwave, stove, oven, fridge / freezer dishwasher and washing machine. Each of the bedrooms in this magnificent house are en-suite and are decorated in crisp white and turquoise creating a relaxed coastal holiday ambiance. The main bedroom has a flat screen TV with access to the DSTV.